“Drag & Drop” function can be used in every slide of your presentation to insert photo/image. Open the folder where the required image is located. Drag the image file with a courser directly into the field for inserting an image. 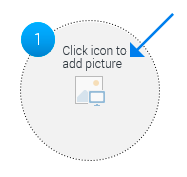 Click on the active icon in the field for inserting an image. This opens a dialog box in which you can select the image to be inserted.